New African no-frills carrier Fastjet has begun its long-awaited first services in Tanzania. The airline, which is being backed by Easyjet founder Sir Stelios Haji-Ioannou, ran its maiden service on November 29 from Dar es Salaam to Mwanza in Tanzania using its first Airbus A319. There will be 3 aircraft, all A319s. Fastjet said this marks “the start of a new, revolutionary, smart way to travel for African people, and our first steps towards becoming a low-cost, reliable pan-African airline.” They plan to add a 2nd base in Nairobi, before extending its network to Accra and Luanda, Angola. Fastjet’s ambition is to carry more than 12 million passengers a year, from the 500,000 at present, by cashing in on demand for regional travel from a burgeoning African middle-class – with some 3 million of them “flying several times a year”. Prices to start with may be as low as $20 one-way excluding taxes and charges. They are selling cheap flights as “smart travel”. In June, Fastjet bought Lonrho’s aviation business, which currently flies in Africa under the Fly540 branding, with operations in Kenya, Tanzania, Angola and Ghana. New African no-frills carrier Fastjet has begun its long-awaited first services in Tanzania. The airline, which is being backed by Easyjet founder Sir Stelios Haji-Ioannou, ran its maiden service today (November 29) from Dar es Salaam to Mwanza in Tanzania using its first Airbus A319. The company said the first flight was “almost full to capacity” and passengers were welcomed onboard by Fastjet chief executive Ed Winter. A second A319 from Dar es Salaam to Kilimanjaro in Tanzania also took off this morning, while a third aircraft is due to arrive next week. The carrier plans to add a second base in Nairobi, Kenya, before extending its network to Accra in Ghana and Luanda, Angola. New no-frills African airline Fastjet is gearing up for the take-off of its first services later this month. The project, which is being backed by Easyjet founder Sir Stelios Haji-Ioannou, is due to launch its new website next week when it will also reveal its first routes and pricing structure, with prices promised to start from $20 one-way excluding taxes and charges. The airline has received its first three Airbus A319s, which are currently being painted in Fastjet’s new livery featuring an African grey parrot. Fastjet, which is being led by former Easyjet chief operating officer Ed Winter, will begin services from the Tanzanian capital of Dar es Salaambefore expanding to other African cities with Nairobi in Kenya set to be the second base. Winter said: “The African grey is renowned for its intelligence and is therefore a perfect personification of Fastjet’s motto: smart travel. We are delighted to be unveiling this new branding today, which better reflects our individual corporate identity and speaks to our key audiences. After establishing its first two bases in eastern Africa, Fastjet plans to extend its network to Accra in Ghana and Luanda, Angola. Fastjet chairman David Lenigas said: “We are excited that the launch is now imminent and that Fastjet will be turning from a concept into a reality. In June, Fastjet purchased Lonrho’s aviation business, which currently flies under the Fly540 branding, with operations in Kenya, Tanzania, Angola and Ghana. Sir Stelios Haji-Ioannou, the founder of EasyJet, is set to launch a low-cost airline in Africa this year after taking a 5% stake in a new venture. The easyGroup tycoon, who is embroiled in a long-running boardroom battle with easyJet, is backing a carrier that will operate under his Fastjet airline and be run by former easyJet executives. Fastjet will operate from Kenya, Tanzania, Ghana and Angola. The ambition is to carry more than 12 million passengers a year, from the 500,000 at present, by cashing in on demand for regional travel from a burgeoning African middle-class. 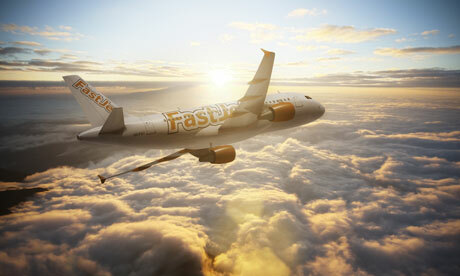 EasyJet remained tight-lipped about the move, referring queries to a statement made last year that said the Luton-based airline would take “necessary action” if Fastjet infringed its rights. However, Ed Winter, Fastjet’s chief executive-in-waiting and formerly easyJet’s chief operating officer, said the airline would avoid antagonising its European peer. “We have been 100% careful. We are absolutely aware of the agreement, and so is Stelios, and we are not infringing it in any way,” he said. Under the terms of Wednesday’s announcement, an Aim-listed cash shell company called Rubicon has bought the aviation arm of Lonrho, an ancestor of the pan-African conglomerate formerly run by Tiny Rowland, in a deal worth $85.7m (£55m). As part of the deal, easyGroup will own 5% of Rubicon, and the airline will use Lonrho Aviation’s network. It will operate from the Lonrho hubs in the four African countries. Operating as Fly540, Winter said a 12-million passenger target was feasible. Winter said Fastjet would launch towards the end of the summer but not use its fleet of 10 turboprops and small jets. Instead it would seek to lease larger modern jets like the Boeing 737 or Airbus A319. However, the financial health of African airlines remains fragile. According to the International Air Transport Association, airline traffic in the continent will grow by 4% this year, but African carriers will make a collective loss of $100m in 2012, having made no profit in 2011 and a profit of $100m in 2010. EasyJet has been locked in a dispute with Haji-Ioannou since 2008 over its capacity plans and the purchase of new Airbus aircraft, although another dispute over further use of the easyJet brand was settled in a deal that could earn the tycoon at least £65m over 10 years. Haji-Ioannou and his family control 37.5% of the airline. It’s the “world leader in low cost flights in Africa”. Its website boasts the cheapest flights and the best service on the continent. What’s more, it could be flying towards a joint venture with easyJet founder Sir Stelios Haji-Ioannou. Only unfortunately some of its flights don’t seem to exist. Last week Fly540 was offering flights from Luanda, the capital city of Angola, to Lubango and Benguela. This is Fly540, an airline owned by Lonrho, the London-listed company once run by Roland “Tiny” Rowland. It lists on its website a string of destinations across Angola, Kenya and Ghana. Last week it was offering flights from Luanda, the capital city of Angola, to Lubango and Benguela. The services were detailed on Lonrho’s website with flight numbers, departure times and price. Some were listed as available, others sold out. The discrepancy between what Fly540 is purporting to offer and its operation comes despite Lonrho announcing “a full roll out of services in Angola” to the London Stock Exchange in July. According to Lonrho executive chairman David Lenigas, a listed-market entrepreneur with 147 directorships to his name, the lack of flights between the two destinations reflects the problems of establishing an airline in Africa. Problems servicing the routes have come hand in hand with huge losses for Fly540. Although Mr Lenigas said last week that the airline “makes money” the most recent accounts show it sinking deep into the red. Operating losses for the six months to the end of September topped £7.9m, up from a loss of £4.8m in the previous year. This has led to some analysts suggesting the company could be sold, which was denied by Mr Lenigas. However, the financial and operational performance of Fly540 has not stopped Lonrho’s aviation ambitions enjoying some success. Earlier this month the potential joint venture with Sir Stelios’s easyGroup attracted huge interest from investors. Rubicon Diversified Investment, a company in which Lonrho is an investor and which Mr Lenigas and his chief executive Geoffrey White, are directors, revealed plans to launch Fastjet, a new African airline with Sir Stelios. The announcement sent Rubicon’s shares soaring from less than 1p to over 10p, before settling back to end the day at 7p. Good news for Lonrho. Two weeks before the share spike, Lonrho, along with unnamed private investors, agreed to buy 40m shares in Rubicon at 1p. On Rubicon’s current share price of 4p the investment has quadrupled in value netting a paper profit of around £1.2m. The new-found buoyancy in Rubicon’s shares helped the company raise a further £9m from institutional investors last week, this time at 4p a share. Mr Lenigas said the money would be used to acquire new aircraft for Fastjet. “Stelios is very excited about the prospects in Africa. No it’s not easy getting things done, but the demographics and the economic growth make it enormously attractive. The next step could be to bring the two airlines, Fastjet and Fly540 together, which Mr Lenigas said “was an option”. Trying to roll out that model across Africa will not be easy. Sir Richard Branson spent three years trying it with Virgin Nigeria. It cost him millions and he pulled out in 2008. Posted: Friday, November 30th, 2012. Filed in General News, Recent News.